People with uncontrolled sugar levels can over time, develop nerve damage throughout the body. Some people with nerve damage have no symptoms and others may have symptoms such as pain, tingling, or numbness (loss of feeling in the hands, arms, feet, and legs). Make sure that you give your feet thorough examination every night to see you have not developed any sores, blisters, cuts etc. as they can lead to numbness. Always cut and trim your nails with a safety clipper, never use scissors. Cut nails straight across and then smooth the edges. To ease nail cuts do it after your shower. Wear cotton or wool socks according to the climate. Avoid elastic socks and cheap materials because they may impair the circulation. Wear sturdy, comfortable shoes whenever feasible to protect your feet. Be sure to check with your doctor on the kind of shoes you wear. Don't be tempted to warm your cold feet with a heating pad or hot water bottle during cold weather. If you have neuropathy, you may burn yourself without even feeling it. Indulge yourself in a gentle foot massage. Make sure that after the massage, you clean away any remaining oil from between your toes. If you use adhesive tape, remove it carefully because it can weaken the skin when you pull it off. Consider using paper or cloth tape instead. If the sore is not healing or if you notice signs of infection, such as redness, red streaks, warmth, swelling, pain, or drainage, see a podiatrist. After a bath, dry your feet and coat them with a thin layer of moisturizer. Do not use oils or creams between your toes. Do not soak your feet for long time. The more you do, the more you put yourself at risk for infection. Regular exercise will improve bone and joint health in your feet and legs, improve circulation to your legs, and will also help to stabilize your blood sugar levels. 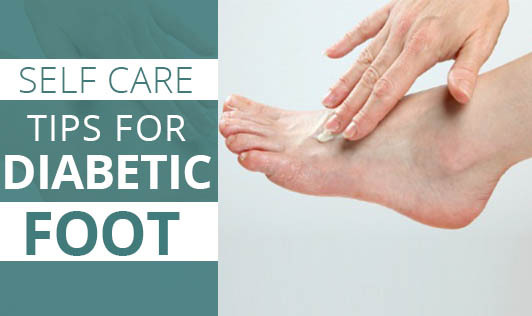 In addition to having regular medical checkups, the best way to avoid the progression of diabetic neuropathy is to control your blood sugar, take good care of your feet, and practice wise health habits. It is important to practice preventative care like the tips listed above. See a podiatrist for corns, calluses or ingrown toenails. Do not attempt to self-treat these conditions!